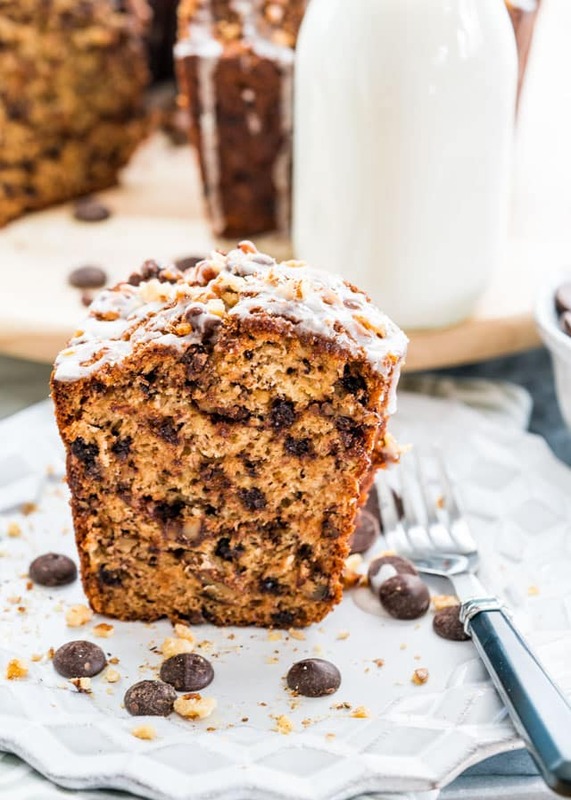 This Banana Chocolate Chip Coffee Cake recipe is a tasty new take on your regular banana bread. 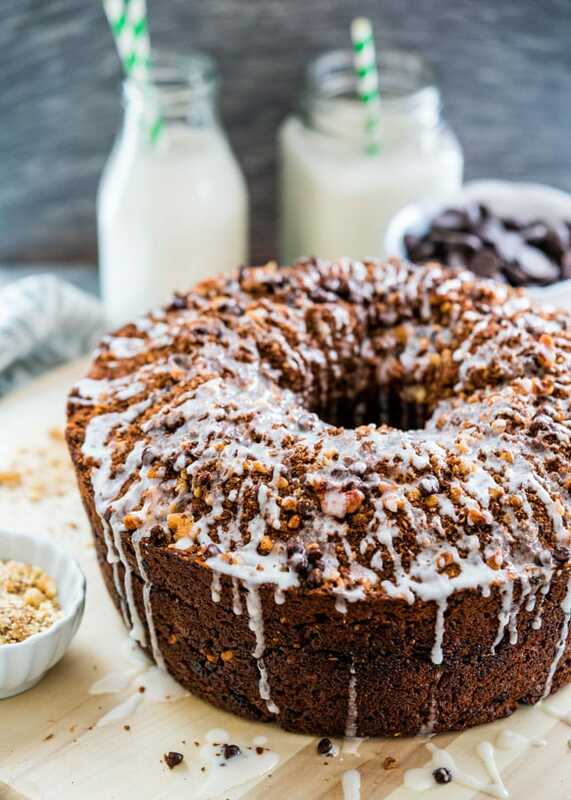 Loaded with walnuts, chocolate chips, and a brown sugar cinnamon filling, this coffee cake won’t let you down! You know what my favorite breakfast is? A slice of coffee cake with a nice big steaming cup of coffee. 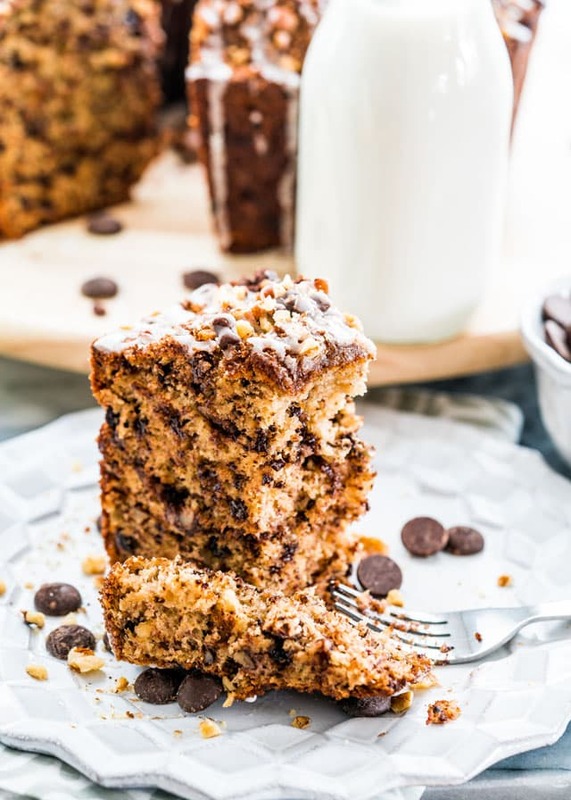 This banana chocolate chip coffee cake is definitely my kind of breakfast. I don’t know what it is but lately all I want to do is make cakes because I can’t stop craving them! My dreams are made of cakes. Hmm…weird, I know. I should have been a baker. 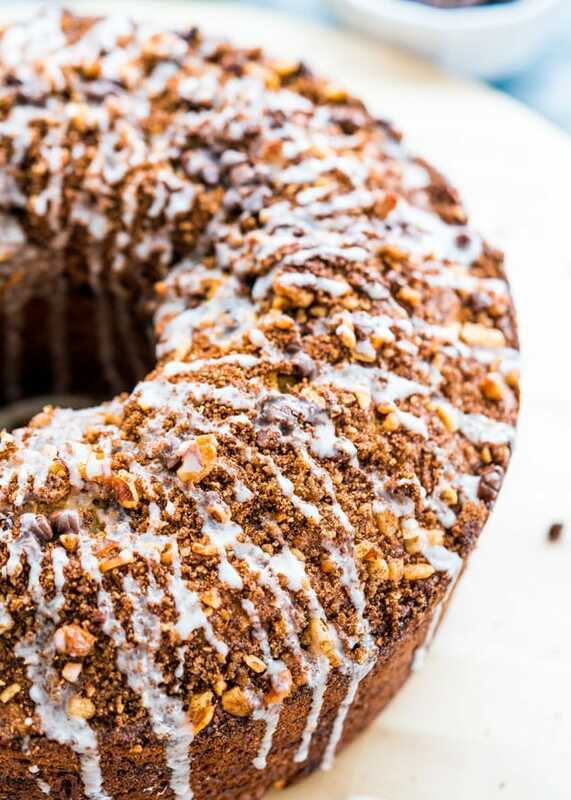 While sometimes “coffee cake” does refer to a cake flavored with coffee, it’s usually referring to a slice of cake to be enjoyed with a cup o’ joe. That’s exactly what this recipe is! There is no coffee in the ingredients. This style of “cake” is actually more similar to a sweet bread, and is a fantastic accompaniment with your coffee (or tea!) to start your day off right. What do you do when you have lots of over ripened bananas? 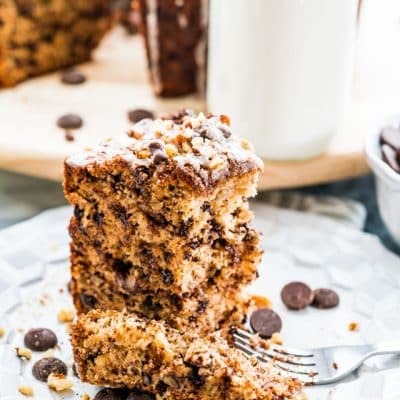 Well you can make some classic Banana Bread, or spice it up and make this banana chocolate chip coffee cake, of course. For this cake we’ll be using flour, a healthy portion of each baking powder and baking soda to create a nice and light cake, salt eggs, vanilla, and sugar. Sounds like a pretty standard cake so far! Here’s what makes this coffee cake so superior. I always put sour cream in my banana breads and coffee cakes! It gives it such a rich and delicious consistency. But what if I don’t like sour cream? That’s okay! You won’t taste it at all. I also used applesauce in place of oil to cut down on some calories, and finally mixed in some walnuts and chocolate chips. SO GOOD! The filling and glaze are each only 3 ingredients and so easy. These little touches really make the cake taste like it’s straight from a bakery. I used brown sugar, cinnamon, and some roughly chopped walnuts for the filling, then finished this gorgeous cake with a simple glaze of powdered sugar, vanilla, and milk. 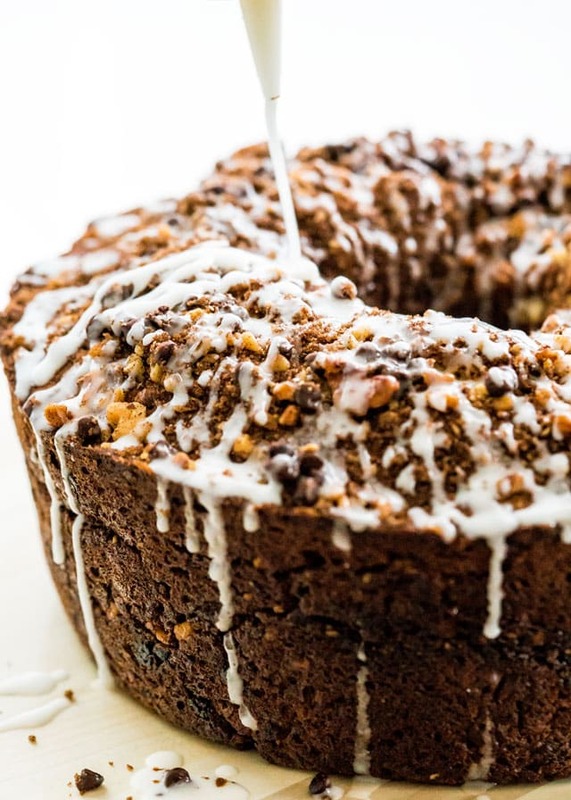 While I think the combination of chocolate chips and walnuts in this recipe is so good, you are free to make your own perfect version of banana coffee cake. You can even leave the mix-ins out if that’s what you prefer! Using different pans may affect the baking time, so keep an eye on your cake if you use one of these options. 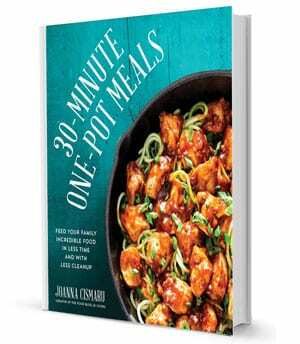 Preheat your oven to 350 F degrees and generously spray your pan with cooking spray. If using an angel food cake pan or bundt pan, be especially diligent with spraying! Make sure you don’t miss the tube. In a large bowl mix the flour, baking soda and powder, salt, walnuts, and the chocolate chips. In a separate bowl, mash your bananas. You can use a fork or a potato masher, but it really doesn’t matter. Punch the bananas for all I care; as long as they’re nicely mashed you’re good. I like to leave them just a little chunky. Biting into a nice soft piece of sweet banana is my favorite part! Add the sour cream, eggs, applesauce, vanilla, and sugar to your bananas. Give everything a whisk until fully mixed. Pour the wet ingredients into your big bowl of dry ingredients and stir everything together using either a spatula or a wooden spoon. Mix the walnut filling together in a small bowl. Spread 1/3 of the cake batter evenly in your baking pan of choice, then sprinkle 1/3 of the walnut filling over it. Repeat, batter-filling-batter-filling, and bake for about one hour, or until your cake is fully cooked. Let the cake cool on a wire rack for 10 minutes. While the cake is cooling, you can make your glaze. You can adjust the milk called for in this recipe to create a thicker or thinner glaze- it’s up to you! Start with a little bit of milk and work up until you’re happy with the result. Drizzle the glaze over your cake, slice, sit back, and enjoy that first warm bite. I always go for the toothpick test when making cakes, muffins, quick breads, etc. Insert a toothpick into the thickest part of the cake, and if it pulls out clean, your cake is all done. 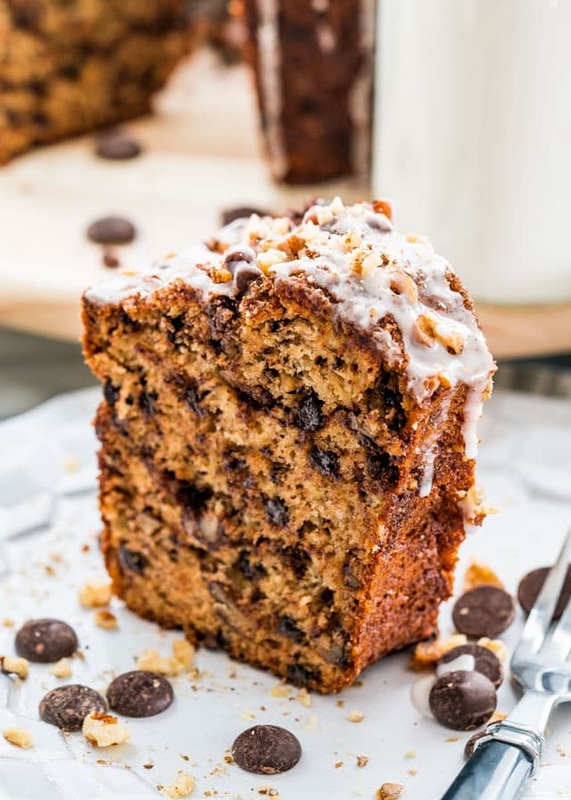 It can be a little more difficult when baking with melty fillings such as chocolate chips, because you almost always hit one when you insert the toothpick into the cake. Take a close look at that toothpick. Do you see any lighter colored batter on it? Leave it for another 5-10 minutes at a time until no batter sticks to the toothpick. Do you just see some melty chocolate on the toothpick? Great! Your cake is done. The filling and glaze make this cake incredible, but you can cut down on those components to save calories. You can cut the filling in half and just add a small layer in the middle of the cake and on top, and cut the glaze out completely. Don’t over-bake! This type of cake is a bit more dense, and can dry out if it’s left in the oven too long. Let the cake cool on a wire rack vs cooling in the pan so the sides don’t get too dark. Use a serrated knife to cut slices to avoid squishing your pieces down. Yeah, this cake is all that and a bag of chips. A bag of chocolate chips, that is. Do people still use that phrase? Am I not cool anymore? I bet if you have a slice of my cake you’ll think I’m super cool. This cake will last about 2 days at room temperature, or 1 week in your fridge. Wherever you decide to keep it, make sure you wrap it well in foil or plastic wrap so that this delicious cake doesn’t dry out. Yes, absolutely! You can leave this cake in your freezer for 2-3 months. Again, make sure it’s wrapped up really well with foil or plastic wrap. Baked goods are very susceptible to freezer burn. I also like to freeze this cake in individual slices to make thawing much easier. 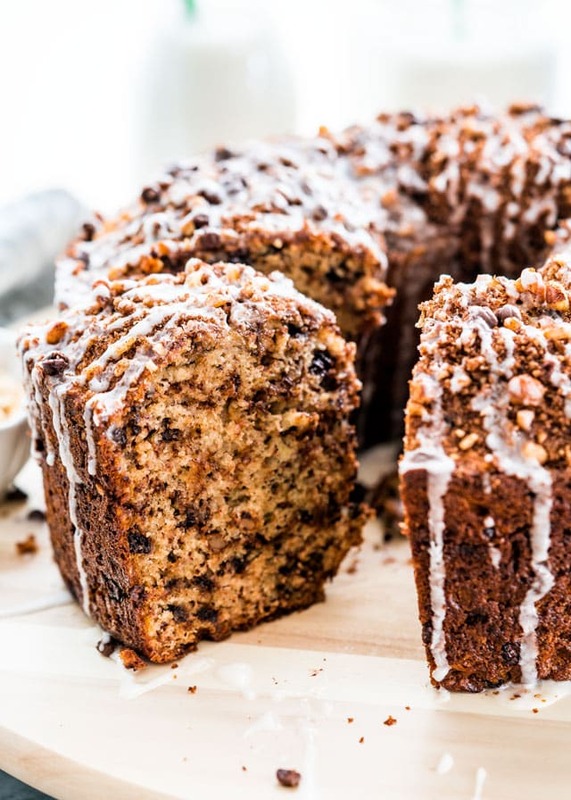 This Banana Chocolate Chip Coffee Cake is a tasty new take on your regular banana bread. Loaded with walnuts and chocolate chips and a brown sugar cinnamon filling, this coffee cake won't let you down! Preheat oven and prepare cake pan: Preheat your oven to 350 F degrees. Spray a 10 inch angel food cake pan with cooking spray. Set aside. Combine dry ingredients: In a large bowl combine the flour, baking soda, baking powder, salt, walnuts and chocolate chips. Combine wet ingredients: In another medium bowl mash the bananas using a fork or a potato masher. Add the sour cream, eggs, applesauce, vanilla extract and granulated sugar and whisk everything together. Combine wet and dry: Pour the wet ingredients into the bowl with the flour and using a spatula mix everything together. Prepare filling: In another small bowl combine all the filling ingredients together. Assemble cake: Spread 1/3 of the batter into the prepared cake pan. Sprinkle 1/3 of the filling over the batter and repeat 2 more times to finish the rest of the batter and filling. Bake: Place the cake pan in the oven and bake for about 1 hour or until a toothpick inserted in the center comes out clean. Cool the cake in the pan for 10 minutes then remove and continue cooling on a wire rack. Make glaze: Meanwhile, make the glaze by whisking all the ingredients together in a small bowl, adding more milk if needed. The glaze should be smooth and thin enough to drizzle. Drizzle with glaze, cut and serve: Drizzle the glaze over the cake, cut into slices and serve. 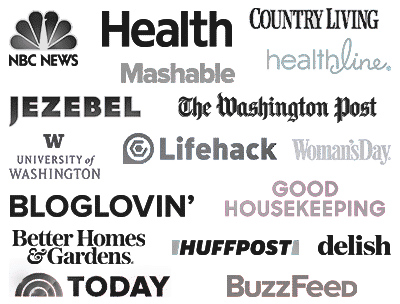 The applesauce could be replaced with vegetable oil, butter, or even coconut oil, if preferred. Hi. Sounds delicious. I’m wondering about the coffee though – (aside from in the name) I don’t see coffee mentioned anywhere. Is there actually coffee in this? Thanks, Sara, hope you give it a try! for the banana chocolate Chip cake, can this b made in a 10 inch bundt pan. I am not sure if the 10 inch is large enough for this recipe. You could give the 10 inch a try and leave about 2 inches from the top to ensure it doesnt bake over the edge. Let us know how it turns out. I am sure it will be something someone else will want to try.